I had our whole day planned out. I was going to make brunch at home. We’d watch the race then I’d make dinner. No more dining out this weekend. That is, until the waffle disaster. I was setting up my George Forman to make waffles when J found a recipe for Ginger Spiced Waffles. I don’t really like Gingerbread Cookies, so this recipe did nothing for me, but I always feel bad making J eat what I want to eat, so I was going to make those for her and make regular waffles for myself. I didn’t want to make the whole recipe of either because that would have been way too much food. I started with J’s and it quickly became obvious why I was a Journalism major in college. J somehow connected waffles to chicken and asked about the place on the corner of Westnedge and Kilgore. 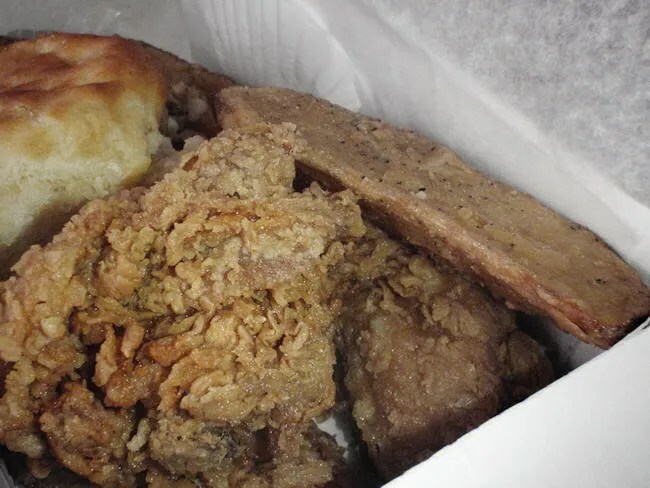 I had stopped at Lee’s Famous Recipe Chicken once before long before we moved to Kalamazoo. On one of my solo trips back to Illinois, I pulled off the highway at Westnedge look for food. 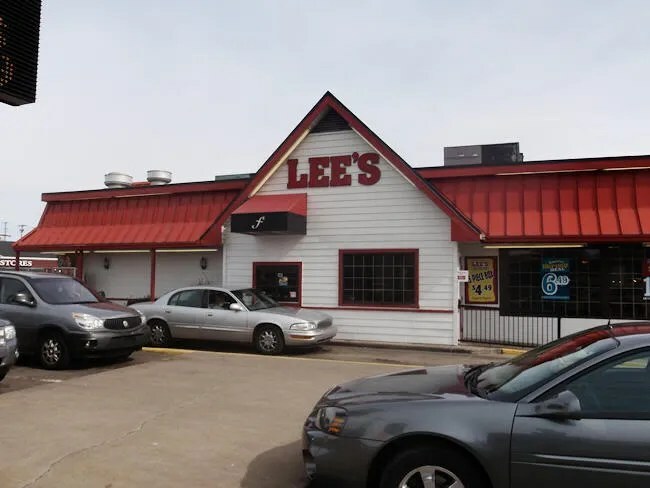 I had never heard of Lee’s before so I was a little surprised to find out it was a chain. I was even more surprised when I learned it’s somewhat of an off-shoot of KFC. The Lee who the restaurant was named after is a nephew of Colonel Sanders and actually helped him launch the KFC franchise. 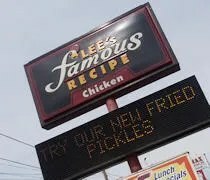 After KFC was sold, Lee Cummings went to work on his own “Famous Recipe” and Lee’s Famous Recipe Chicken was born in 1966 in Lima, OH as Harold’s Take-Home. Later that year, the franchise unit was sold in Columbus, OH. In 1967, Lee’s made its way to Kalamazoo as one of the first Lee’s Famous Recipe Chicken Franchises. Last time I stopped at Lee’s, I got chicken strips because I needed something I could eat in the car. I was really interested in actually trying the chicken, so I ordered the Three Piece meal. With that meal, you get a wing, a thigh, and a drumstick plus one side, a biscuit, and a drink. For my side I went with potato wedges. J went with one of the $3.25 lunch specials. She ordered the Honey BBQ Chicken sandwich which comes with a side and a biscuit. She got baked beans and added on a Sweet Tea. She also ordered Sweet Biscuit Bites. Our total for lunch was just a little over twelve bucks. Not bad and once we saw how much food we got, it really made it even more worth it. The Sweet Biscuit Bites had to be cooked so it took a little longer to get our order, but once we did, we headed home and got right into the boxes. I ordered the Spicy Crispy Chicken and I wasn’t disappointed with either. It was very crispy and just a little bit spicy. The breading had a great crunch to it and the chicken was still juicy, but not greasy. The potato wedges were too big. The outside had a good flavor, but the inside was raw. I ate them all anywhere. They weren’t horrible. They just weren’t great. The biscuit was really good, but still doesn’t even come close to Popeye’s (which I’m sad to say doesn’t have a Kalamazoo location). 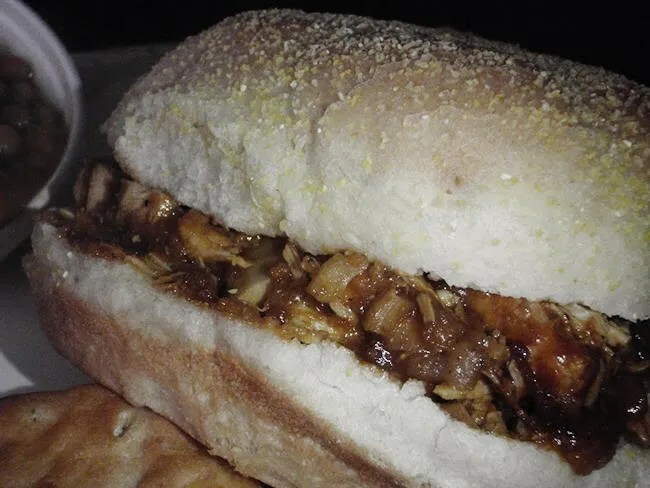 J’s sandwich was a pulled chicken in a Honey BBQ sauce. It was actually pulled chicken too and not a chicken purée like I expect from fast food places. She was taking the honey from the packets we got for the biscuits and adding it to make the sauce even sweeter. The bun was soft and the chicken was good. The beans, however, were not. She took two bites then packed them up and put them in the trash. They were more bean-y than BBQ-y. I didn’t get any of the Sweet Biscuit Bites. I was stuffed after my meal, so J got them all to herself. There were only six in the package and they were pretty small, but they were covered in cinnamon sugar. 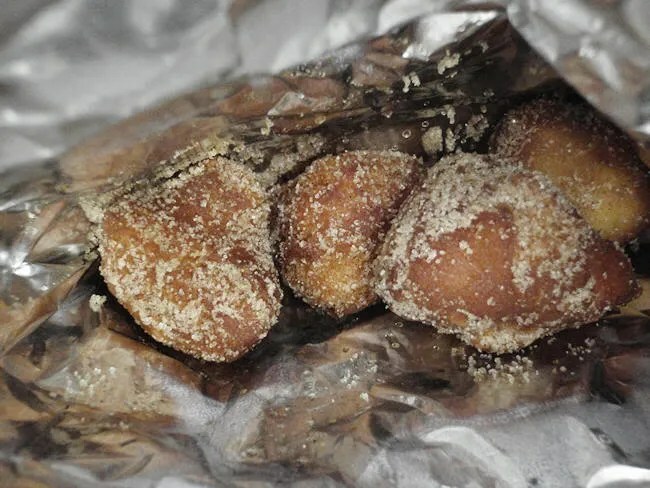 Any sort of deep fried dough covered in cinnamon sugar is going to be good and it sounded like these were. Lee’s Famous Recipe Chicken really hit the spot after my disastrous attempt at math and waffles. The price was pretty good and the portion size made me feel better about eating out again. I did eat four fast food meals this weekend which is very unlike me. I jumped on my Wii Fit yesterday and it said I gained 217 lbs…(after a mistake that said I lost 215), so fast food probably wasn’t the best idea, but it’s not something I do often. I like Lee’s, and totally agree on the potato wedges. This is a common problem with that cut of potato. yeah….not a big fan of potato wedges, but when it’s the only choice…. Service is horrible as well as the food. Over cooked and not a good value. The workers are rude and don’t give you what you ask for. The Lee’s down here in the south are really good, I’ve been to several and they blow KFC away.